"Dear readers, from this rhyme take warning, And if you heard the bell this morning, Your Vicar went to pray for you, A task the Prayer Book bids her do. "Highness" or "Lowness" does not matter, You are the Church and must not scatter. Cling to the Sacraments and pray, and God be with you every day." John Betjeman. 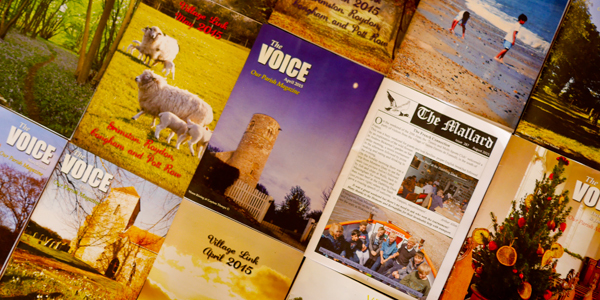 Our Village Magazines are a vital part of village life. They carry not just news of the Church but every facet of life in our villages with contributions from our schools, Parish Councils, and numerous organisations and Societies. The WI, gardening Clubs, Village Halls, The Evergreens and The OWLS and Friendship Clubs, Baby & Toddler Groups etc. etc. and so many more. They carry news and events and always try to promote every charitable concern. They also carry adverts from our local tradespeople ( & Thank You to all of them for their support) which helps us all for those times we need a tiler, or plumber, electrician or just the best place to get a drink. They deeply reflect the generous nature of people here - so many give up time and energy freely to edit and deliver. They are something that we can take some pride and satisfaction in. They are delivered to every home in their individual area and exist to support village life - this web site cannot replace them. On the following pages are the latest editions of the magazines - and with all pictures in full colour.